This past weekend, we took the little guy to see jolly old St. Nick, just as we had the year before. We could’ve taken him to a mall, yes, but we’re fortunate to have, within an hour’s drive of us, something truly special – and that’s what’s known as the Candlelight Evening at the Farmer’s Museum in Cooperstown, NY. 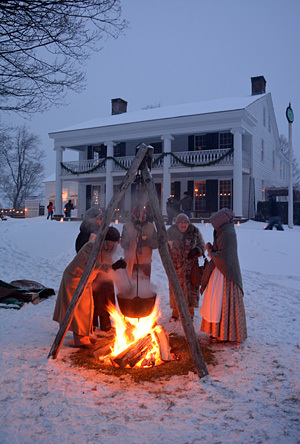 Amid a Victorian village, horses draw carriages of guests, while people sip wassail from cauldron’s scattered throughout the village. Walkways are lined with luminaries to guide your way, with visits to such places as the Blacksmith Shop, the Typesetter’s, the Apothecary and much more, bringing to life what it was like to live, breathe, work and play in an era long gone. Last year. All my expectations for this year were wrongly built upon this. But, above all else, it’s also where we find Santa. Not just any Santa. No, it’s the most wonderful, believable Santa I’ve ever had the pleasure to encounter. Even before we had a child, Meg and I would go to this yearly event and get our picture taken with ol’ St. Nick. Now a yearly pilgrimage for our family. We had a wonderful time last year, carrying our little guy, then one, through the village, seeing the sights and sounds of life from over a century ago. The pictures were perfect, the experience, a delight. This year, however, history did not exactly repeat itself. In years past, we’ve purchased our tickets online, meaning when we were able to enter immediately upon our arrival – no lines, no waiting. This year, we waited a bit too long and the morning of, realized the ‘buy in advance’ option online was…no longer an option at that point. The day had been filled from the start. We had a memorial service to attend, followed by some quick, last-minute holiday shopping before picking up the little guy from my parents’ house with plans to put him down for quick nap before heading out again. Unfortunately, trying to cram so much into the morning and postponing his nap until we got home, was a disaster. It was too late in the afternoon by the time we got home and he refused to go down for a nap, no matter how desperately he needed one. And as the clock ticked on by into the afternoon, we realized our time was very limited to get to the event before it wrapped up. So we decided we would head out and hope he slept along the way. Last year we had arrived at the start, finding parking relatively close by in a museum parking lot across the road, and providing plenty of daylight for great family pictures. This year, we found ourselves driving in the dark for 45 minutes, up and down roads, in various parking lots and streets, in the hopes of someone, amid the crowded, filled-to-the-brim parking spaces, would be on their way out, giving us a way in. It finally came, thanks to my wife’s dedication of going back and forth to the same spots until something opened. Eventually, it did, and we got a space in that same museum lot across the road as last year. When we crossed the street and made our way to the event, we found a line of probably more than 50 people stretching out from the entrance way, waiting to buy their tickets and head inside. With no tickets in hand, we had no other choice, and waited, each of us holding one of the little guy’s hands as he swayed back and forth, up and down out of boredom. A baby in a stroller behind us kept him occasionally entertained, as well as occasionally crossing that border between tickling and accosting that’s oh-so hard for a two year old to understand, no matter how you describe it to him. 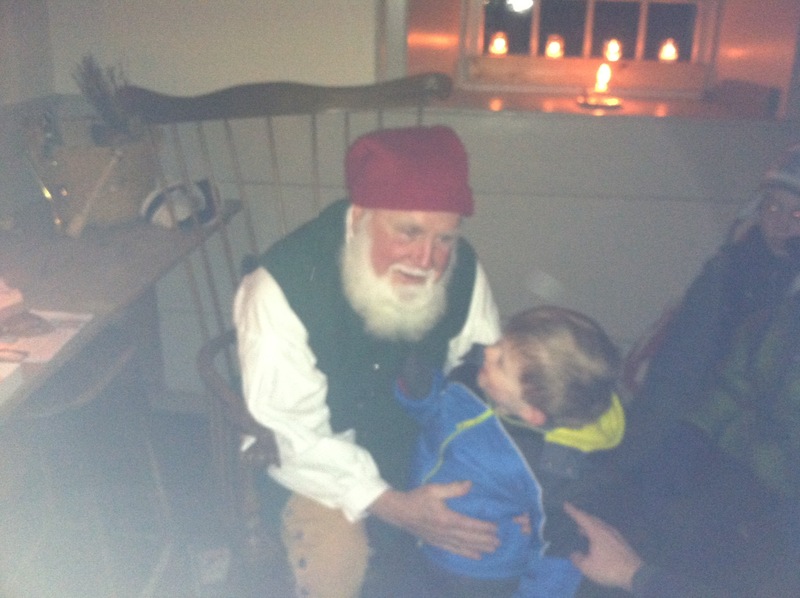 He surprised us with how well he held it together waiting in line to get in, although once inside, the line around the building for horse-drawn carriage rides was just too much, and we instead opted to make our mission, above all-else, to find that jolly old elf. 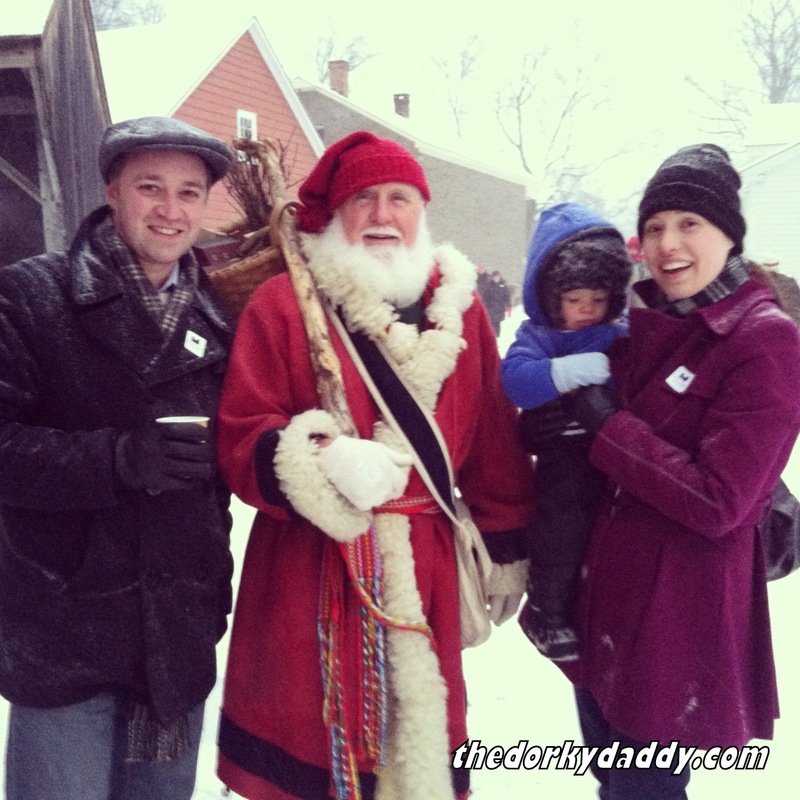 Last year we were lucky enough to catch him walking along the Victorian village and got a family picture with him. (My wife and the little guy even ended up on the event website this year for it!) This year, however, dark had already fallen and there would be no bright outdoor pictures with Santa. So, we found the old schoolhouse, warmed with a wood-burning stove, where he was inside, telling stories by candlelight to the kids. As was the case this far into the event, the line went out the building and we plopped ourselves right at the end of it. Twisting and turning ourselves through the small entryway to let others exit (some, unfortunately, more pushy and uncaring of the small children they were knocking over to get out), and made our way inside. Blurry, best we could get reality of this year. I battled with him to keep him away from the very hot wood-burning stove that sat next to the line, and finally, there we were – face to face with St. Nick. The little guy approached, wide-eyed, calling out “Santa! Santa!” and pointing out his “mama and dada” to the man in red. Was he good or bad? “Me good boy…a little bit naughty,” he said, using his tiny fingers to signify “a little bit.” A quick picture with the cell phone (wouldn’t you know it, mine was full and couldn’t take pictures, but luckily Meg came to the rescue) and off Santa’s lap he went. 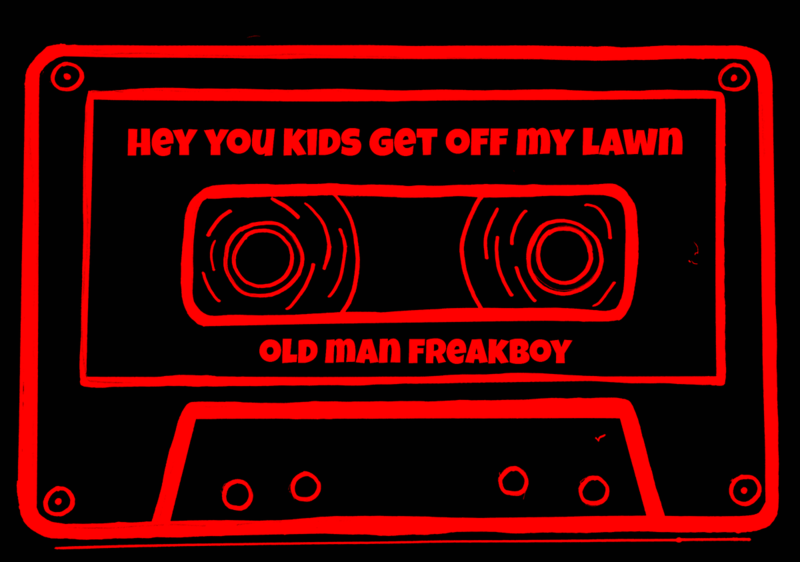 Santa gave him an old-fashioned piece of peppermint candy, and turning to that old elf, my son said “wait. wait. Santa, you bring me…the toys?” “On Christmas Eve,” Santa laughed, and off we went. We took a seat in one of the desks in this old school house, while the little guy chomped and chewed on this peppermint stick and the room quickly filled with more Santa-seekers. Realizing it was time to exit, we thought it best to hold onto the peppermint stick since we wouldn’t be able to see him chewing on it (or how much he put in his mouth) out in the dark. This, compounded with the lack of nap, was a big mistake, and resistance ensued. I have rarely, even in his outbursts of ‘no!’ that have driven me crazy lately, seen him speak with such passion about something. This tiny piece of peppermint was special to him, because it came personally from Santa. So we stayed, the crowds filling in around us, until he finished his peppermint. We exited the old schoolhouse, I grabbed a cup of wassail from one of the cauldrons heated over a wood fire, and we continued to the next great destination – all the animals in the barns at the far end of the village. From sheep to cows, chickens to a bull – and even a barn cat – this was as big a highlight for the little guy as much as seeing Santa. Even in the days since, when someone asks him what he did over the weekend, he talks about seeing the animals. As the night went on, we made our way back through the village and thought that, like last year, dinner would be a good way to cap off the night. In a ‘town mess hall’ type structure, with carolers singing Christmas songs outside its doors, we took a seat at a large table, and I proceeded to get in line for a turkey dinner, some dessert (Meg loves her old-fashioned gingerbread) and some hot cocoa. And as I made my way through the line of people, slowly gathering and balancing all our food, I heard the screams from the far end of the hall, completely identifiable as our little guy having a meltdown. 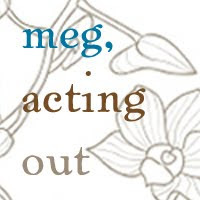 When I got to the table, Meg was there, doing her best, along with a woman who took a seat next to them. Her husband was in line getting their food, and she was making conversation and doing her best to help distract the little guy. It was very nice. We did our best to eat dinner and make conversation with this delightful couple. They had bought a house in the area almost a dozen years ago, moving from Long Island, and the more we talked, the more coincidences or common interests we found we had with them. From their one-time farm and residence in our favorite Vermont getaway village, to their son graduating from the same college as my brother and I, it was one wonderful discussion after the next. Unfortunately, it was all amid the little one, cranky as could be, not wanting anything but gingerbread and brownie, calling false alarms for going to the bathroom, and generally being cantankerous. We had reached a point where we knew the evening was not going to get much better and decided it was time to cut our losses and call it a night. We packed up and headed to the car, and eventually hit the road through the dark, snowy back roads for home, where that fresh air, exciting combination of animals and Santa, and lack of nap put the little guy right to sleep. 2. Always arrive slightly earlier than the event’s start time. 3. Always find a way to schedule/work in sufficient naptime before you leave the house. They aren’t always going to be spectacular, out of the park visits year after year, and sometimes I have to learn not to set such high expectations for family outings. Traveling with a toddler can sometimes bring the most joyous of moments, and also the most frustrating. I often forget, because of how big he is physically, and how verbal he is, that he is still only two year old, and I think I often set my expectations a bit too high for him because of this. There will be good, there will be bad, but the important thing is that, even through those difficult events, travels, etc, memories are being made. Time is being spent together. And that’s what is most important.